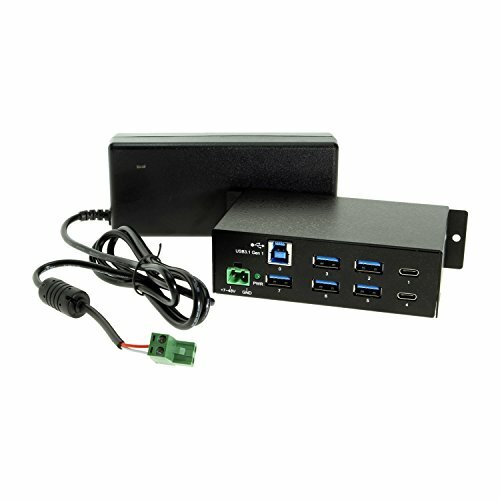 The surge protected USB-C hub is backward compatible with USB 2.0/1.1 using its RISC-like USB controller, it provides a unique self-power mode to work with wide range (+7 ~ 48V DC) input DC power from its terminal block (power adapter included). It supports fast USB charging specifications by turning its downstream ports from a Standard Downstream Port (SDP) into Charging Downstream Port (CDP) or Dedicated Charging Ports (DCP). Does not support power delivery. If you have any questions about this product by Coolgear, contact us by completing and submitting the form below. If you are looking for a specif part number, please include it with your message.